A secure enterprise wide solution consisting of a suite of DDS software capable of managing information across multiple systems. A customizable dashboard enables the user to manage inventory, operator and equipment efficiency, job integrity and more. Users can view and print customizable reports identifying, missing, duplicate, pulled and reprinted documents as well as job status including processing times. Additional benefits include piece-level search capability, duplicate piece detection, and control of pull requests across multiple systems. Central Server architecture is designed to allow all DDS systems to communicate through your companies MS SQL server. This allows you to split your jobs across multiple processing lines while still verifying every piece of the job. Having a central point of data collection, gives management the ability to see what jobs, or job segments and which operators are on every piece of equipment outfitted with a DDS solution. 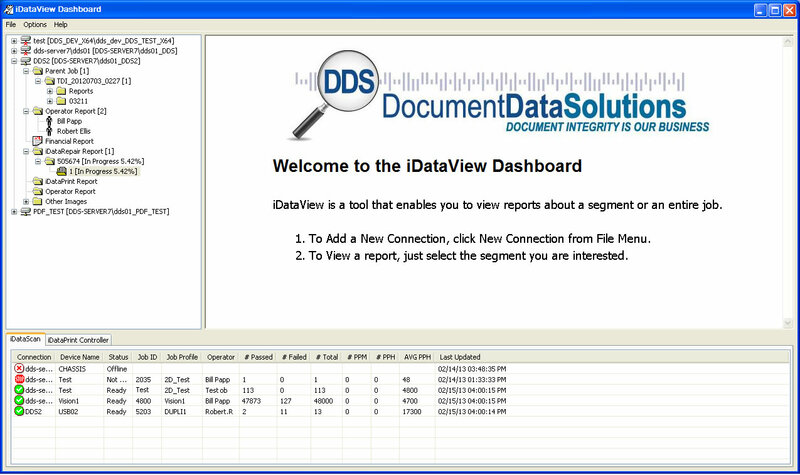 A software package which provides both a report viewer for viewing current and archived reports as well as a device viewer dashboard that displays the current status of each iDataScan™/iDataRepair™ or iDataPrint™ system. This software allows connection of all iDataScan™/iDataRepair™ and iDataPrint™ systems to your companies MS-SQL Server for one central point for data collection. Current jobs will show status in real time. You can check production from your computer desktop instead of going to the production floor. The iDataTask™ software, residing on your MS SQL server, gives you the ability to automate various operations within your workflow. iDataTask™ monitors a specified “hot directory” for predetermined file types and performs various tasks with these files such as creating jobs for piece-level verification, creating reports, transferring files, or initiating e-mail notifications. In addition, iDataTask™ helps to maintain your database by archiving completed jobs and purging outdated information. iDataTask™ can also send email alerts if a required task cannot be performed for some reason. A multi-function vision system that inspects documents, mail pieces, booklets or other items ensuring 100% processing integrity without impeding performance. A variety of barcode scanners and cameras can be used to read barcodes or other symbologies for verification and data collection. iDataScan™ offers high-speed, robust inspection with multiple Regions Of Interest (ROI) within the same camera view. iDataScan's™ flexible, modular design affords easy integration into printers, inserters, book binders, and other processing devices. Management and Piece Level Reporting Software designed to notify the operator of processing errors and allow for real-time correction of these errors without having to wait till the end of the run. iDataRepair™ will notify operators immediately of any processing errors such as missing or duplicate pieces, as well as items that need to be removed from production for special handling. The “Pull Items” list can be sent to iDataRepair™ automatically or added manually at the user interface. Document Data Solutions’ iDataPrint™ can print individually specific variable data, logos and graphics on each envelope passing under the print head. Static logos, graphics, text, permit mail indicia, return address and 1 to 1 marketing messaging are also offered. Actually, the capability is limited only by your imagination. Document Data Solutions programs feature an open architecture that allows you to do what you want with the data without charge. You can create your own custom reports are have us create custom features for you. There is power in the data, you decide how best to use the data for your environment. 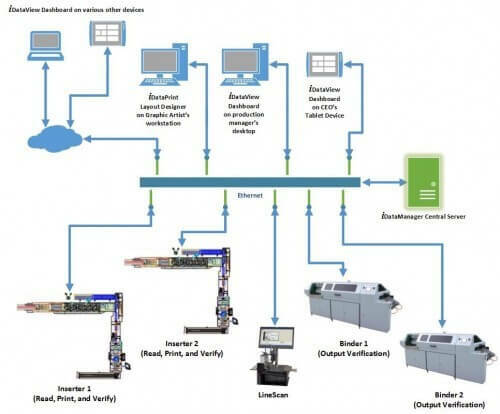 Document Data Solutions has many years of experience in piece level integrity and creating custom solutions for unique requirements in both ink jetting and vision scanning solutions. Give us a call to set up a webinar to see what we can do for your requirements. Also read the Case Study for the US Census Mailing project.